We are an 85 year-old fresh flower and foliage growing and shipping company with wholesale locations at the Original LA Flower Market, Carlsbad Trade Center and Las Vegas. We farm 350 acres of flowers and greens at our farm in Oceanside, CA. 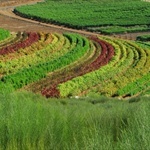 We also farm 50 acres of Ranunculus and a few other select products at or Carlsbad, CA Ranch location.